Today wrapped up the last day of work at the Temple of Faith Primary School in George Brook. It was bittersweet because we are all feeling like it's time to go home to see friends and family; however, we are sad to say good-by to new friends here. A few tears were shed and I am sure there will be a few more, but what a awesome time we have had! The school has a new foundation, literally and figuratively, and the wall that will hold back the bank that will form the outer wall of the new building is 90% done. Our new friends, the work crew, will finish it off by next week and will work on the rest till the funds run out. My hope is that when I come back with another team in November that we will finish and the future of the 250+ kids that attend here, the teachers that teach then and the community at large will change forever. 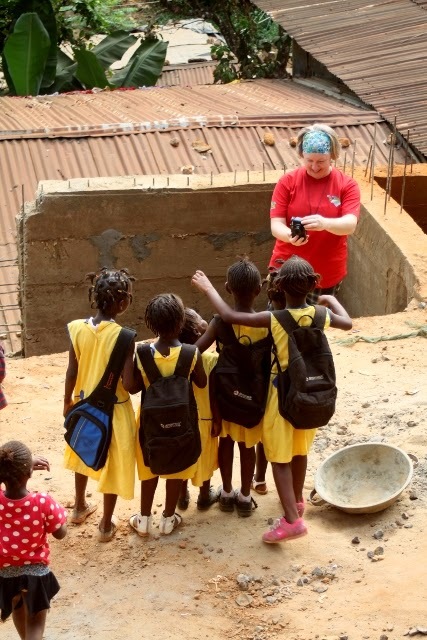 At the end of every volunteer trip, I reflect on what I am thankful for. On this day I am very thankful for a wonderful team who has worked hard, put up with changes on the fly, developed relationship with those around them and have done all this with a willing and glad heart. I am also thankful for a great host partner like the We Yone Child Foundation who have kept us safe, engaged and productive over the last two weeks. 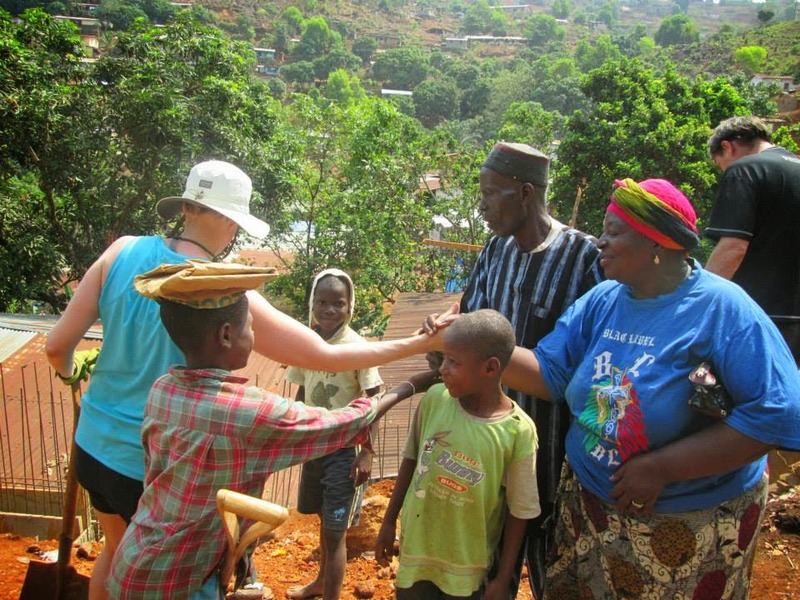 WYCF's Partnership Officer, Sara Portugal, is a wonderful and committed person, and her passion for the kids in the slums of Freetown is contagious. WYFC's Founder and Programme Director, Santigie Dumbuya, is a force to be reckoned with and working with him is a pleasure in every way. He is a true inspiration. The volunteer team with members of the George Brook community. Today was another day on the job site, and we were welcomed by all of the children in their uniforms. This was our first time seeing them in their uniforms. They greeted us half way up the hill in bright yellow and blue colors. They were so proud and so happy. They held our hands all the way up to the job site. What a wonderful welcome to our day! I must say that it is getting easier now to make it up that hill to our job site. 1000 steps is a lot to do first thing in the morning, but I am making it to the top without needing an oxygen tank! We had a bit of waiting to do in the morning, but we managed to get work done with the kids in their uniforms and all. The girls were fetching water and some of the boys too. They put their backpacks aside and started working. Some of the workers were putting a roof on the temporary school this morning so they did not start classes right away. They just hung out with us. That is very much OK with us. They are very curious about us and so we were able to occupy them until the school was ready. Today there was only 85 students who attended school. Once they were all seated down, they were all quiet and well behaved. The principal made a bit of a speech and they listened very attentively. Sara and Santigie then proceeded to hand out some of Terry Shupe's wooden toys, some candy and a few things that Teresa had brought. They sat so well, and they were so thankful for the little gifts that were brought. Most of the kids that were there today also helped out with the project. What hard workers they are! I have never seen anything like it in my life. The gifts were just a little something to say thanks to them. 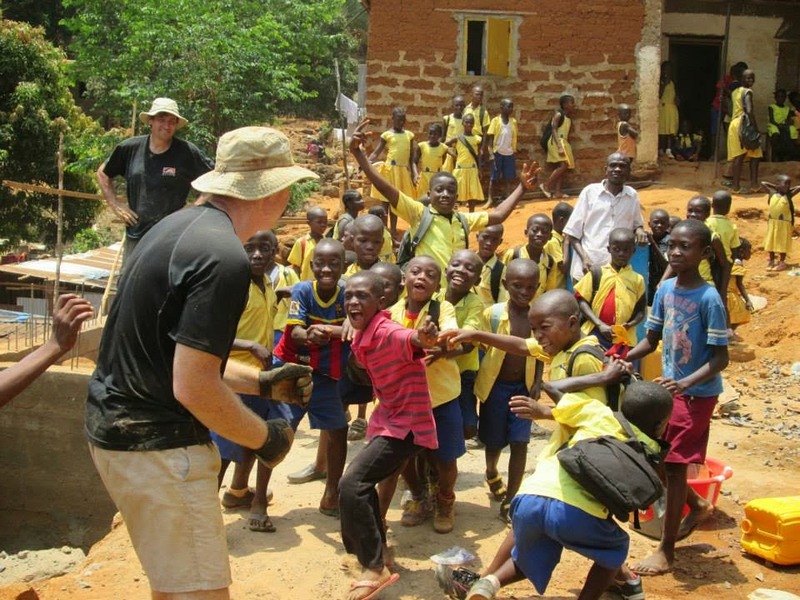 This was just another wonderful day here in Sierra Leone. 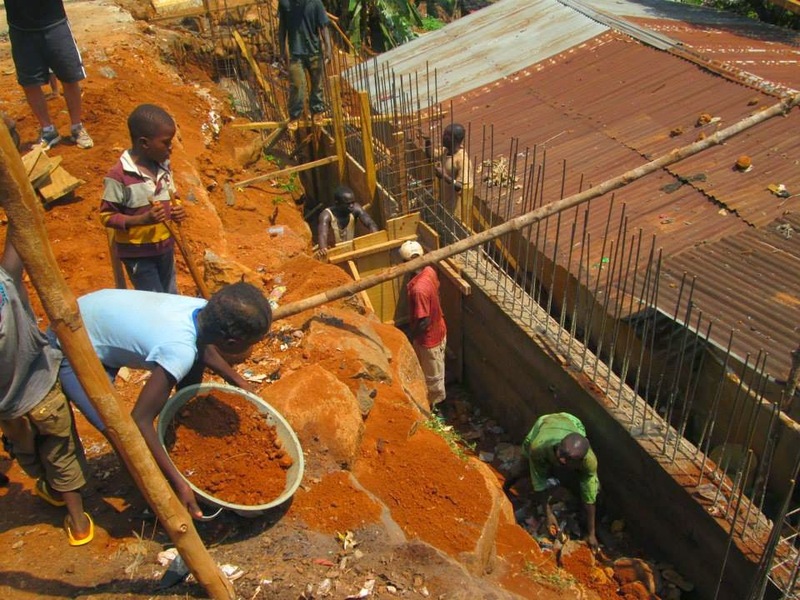 On Day Eight of our time in Freetown, we have gotten three quarters of the main retaining wall done. 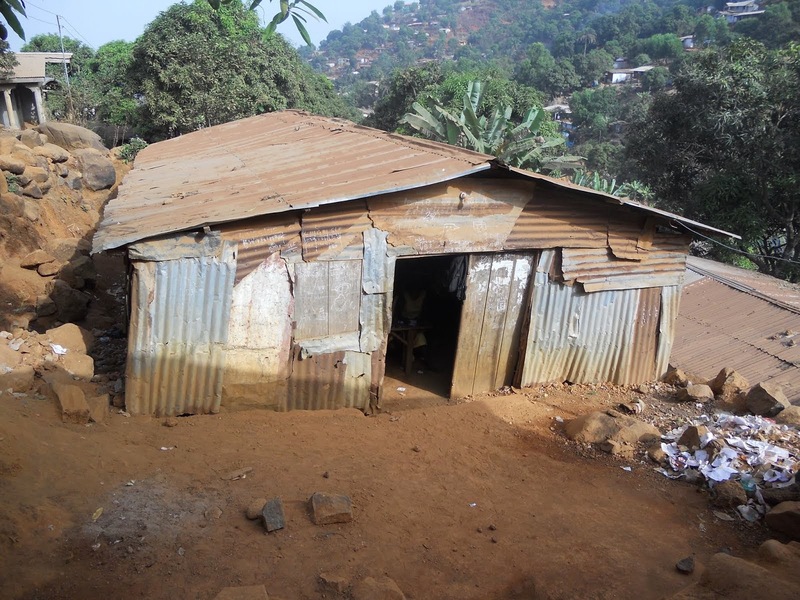 This may seem like slow progress, but when you realize that there is a 10 minute uphill hike from where the road ends at the football field, through a village to the building site and there are no cement mixers or excavators, we are doing pretty good. All materials (sand, cement, rebar, tools) have to be carried these 1000 steps upward to the school site. All the rocks used in the cement mix are broken by hand by local workers and the cement is mixed and pored into the footings by hand. Every bit of dirt moved to make way for forms or to back fill is dug out by pick axes and carried by shovels and pans. Volunteers moving rocks towards the project site. The work is hard, but it is so rewarding to know that we are helping make the way for better education for many underprivileged children. Every day, both on the way to the way to the job site and down again at the end of the day, villagers of the George Brook community come out and make a point of greeting us and thanking us. And those beautiful children call out and come running to say hello. I'm so thankful for this opportunity. 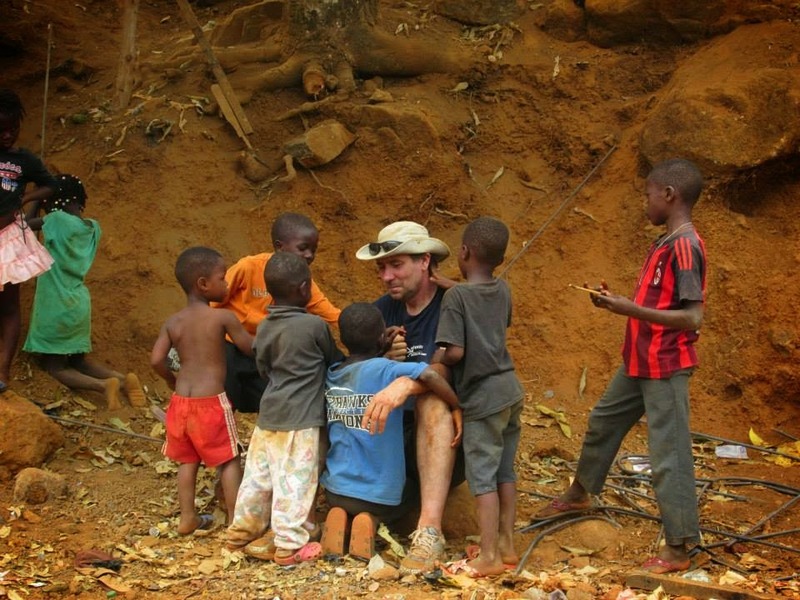 Team Leader Tim Kasten taking a break with some local kids. It is hard to believe that we are already done four days of work. The work is progressing at a good pace. Today we had the honour of having the chief visit the site. He came to welcome our team and thank us for coming to help improve the community. He especially expressed gratitude for DWC coming in to help their community on their terms, in their ways and for not coming to try and change them. Meeting the chief and chair lady of George Brook. Lots of friendly handshakes and smiles! It is reassuring to know that we are employing many residents of the George Brook community. 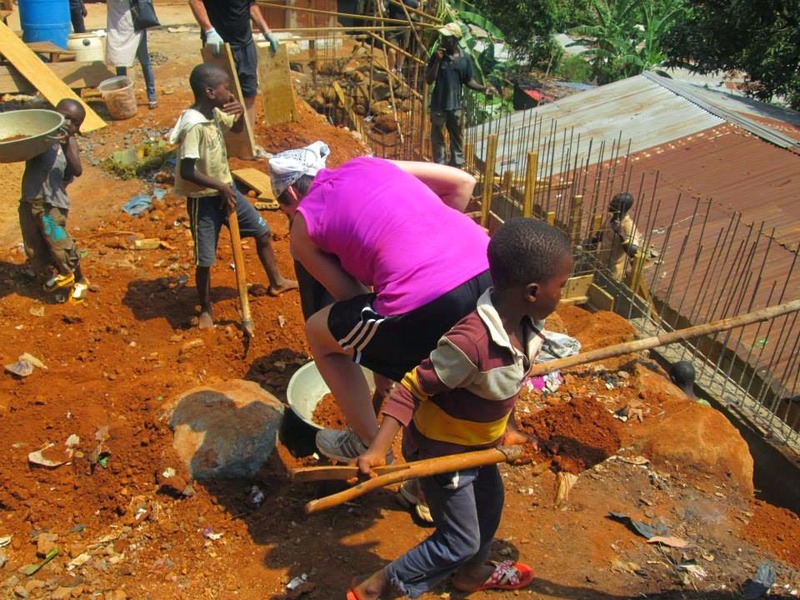 The husband and wife team breaking rocks for the cement are a great example of this; not only are we helping to improving their income, but also we are saving money for the project by not having the rock hauled in. It is heartwarming to know that we are a part of improving relationships and the George Brook community's idea of white people and white work ethic. They are quickly seeing that white people do participate in manual labour, including white women. Gratitude - its a concept that is hard to define for many. What is it? How is it shared? Gratitude is what we are experiencing each day as we hike up to the work site in George Brook. 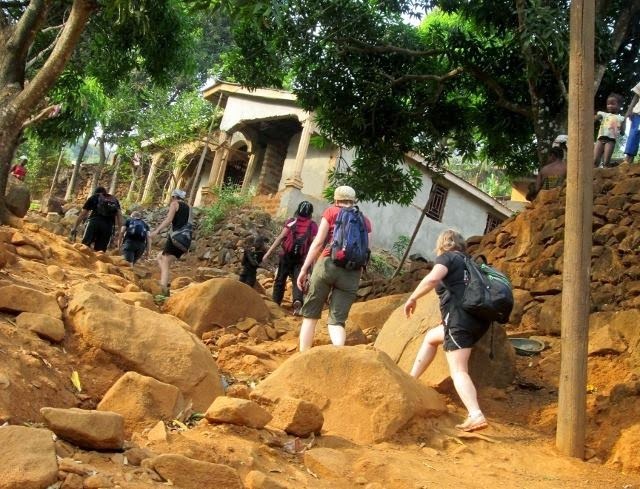 As we make our way up the roughly drawn path of boulders and dust, adults and children alike greet us with a variety of greetings in either the local dialect or broken English. But what really makes an impact is the level of gratitude that is here. We are not only greeted; we are heartily thanked by people as we walk by. They reach out to take our hands as we climb, send words of thanks to us. 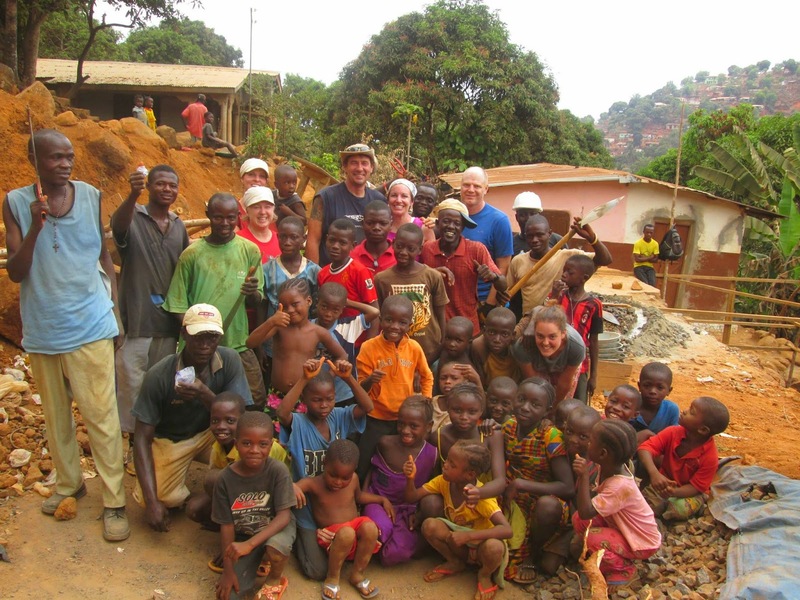 Then we get to the work site, where we are greeted by local workmen and children alike, who are all there to help build their new school. Children as young as six and adults as old as are us volunteers all work together to complete both the small and large tasks, the simple and the complex. 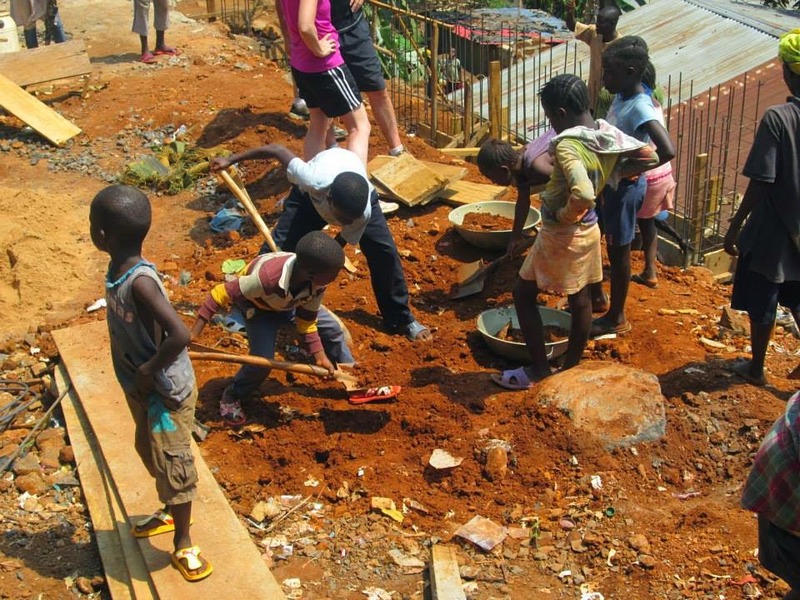 Children working on the job site. 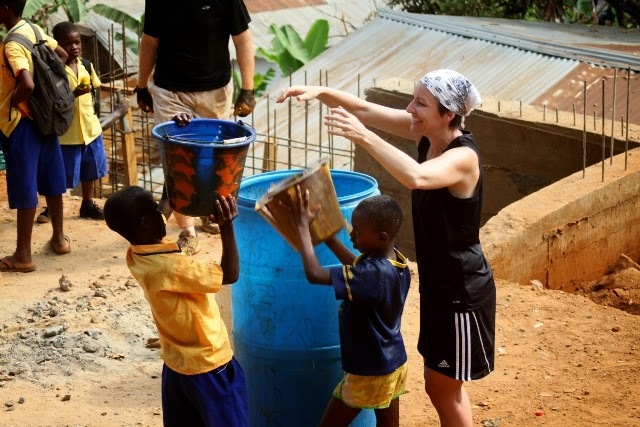 Each day the minister is on site, hands dirty and calloused, just like everyone else. He is pitching sand, mixing concrete and contributing to the emotional and cultural wellness of his community. 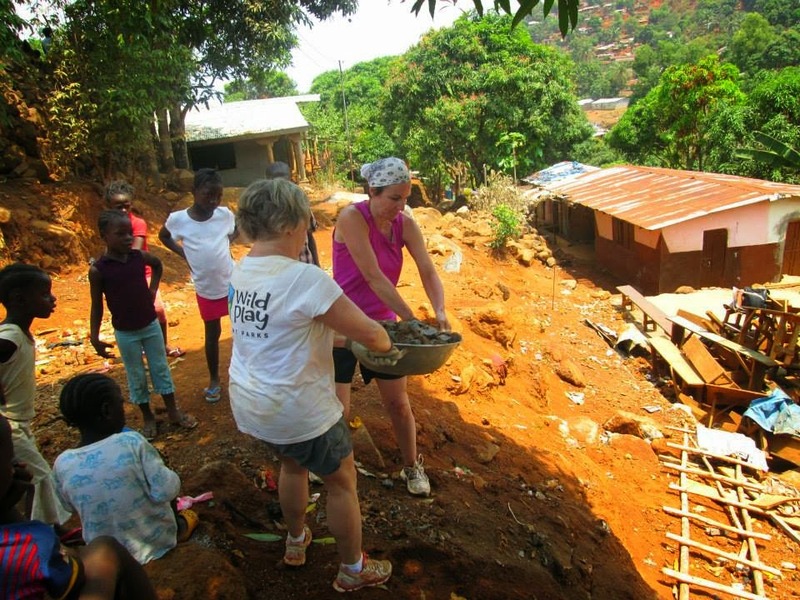 This blog is dedicated to Developing World Connections volunteer groups that have travelled to Sierra Leone. 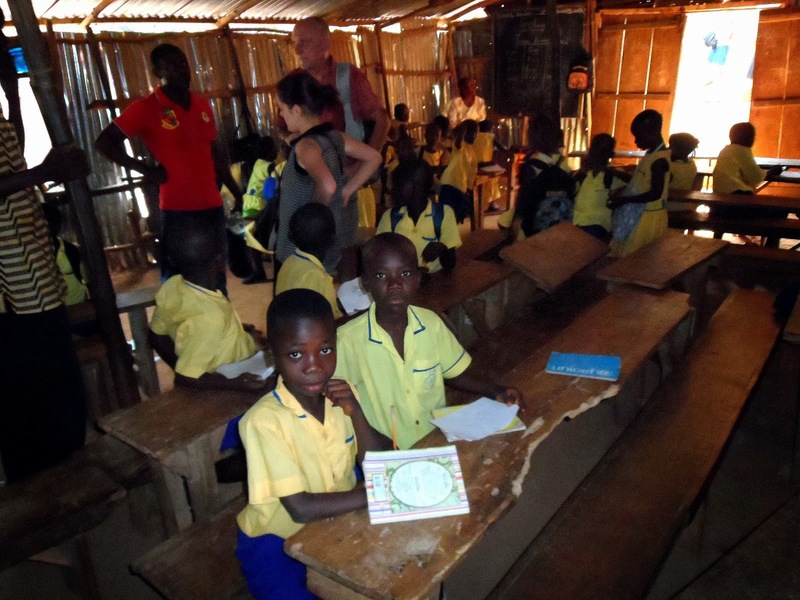 Each team works with our host partner, We Yone Child Foundation, to assist with school rebuilding projects in and around Freetown. 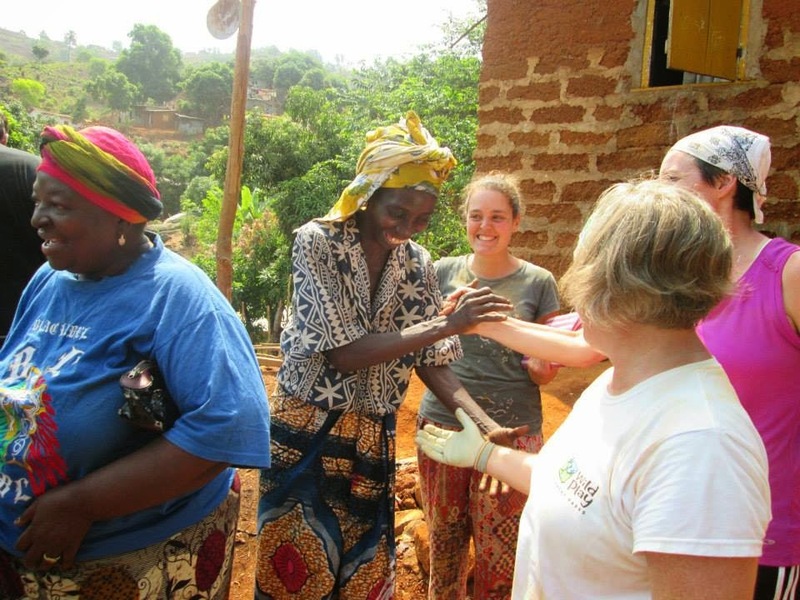 We are volunteer team leaders and participants with Developing world Connections helping out in countries in Asia, Africa and Latin/South America on international development projects.